BRASILIA, Brazil — China extended billions of dollars in loans and investment to Brazil as the South American nation reels from a slowing economy and a corruption scandal engulfing its largest oil producer. China Development Bank and the Asian country’s export credit financing agency agreed to provide a total of $7 billion in financing for Brazil’s state-run energy company Petroleo Brasileiro. And Tianjin Airlines signed a contract to buy 22 jets from São Paulo-based Embraer. 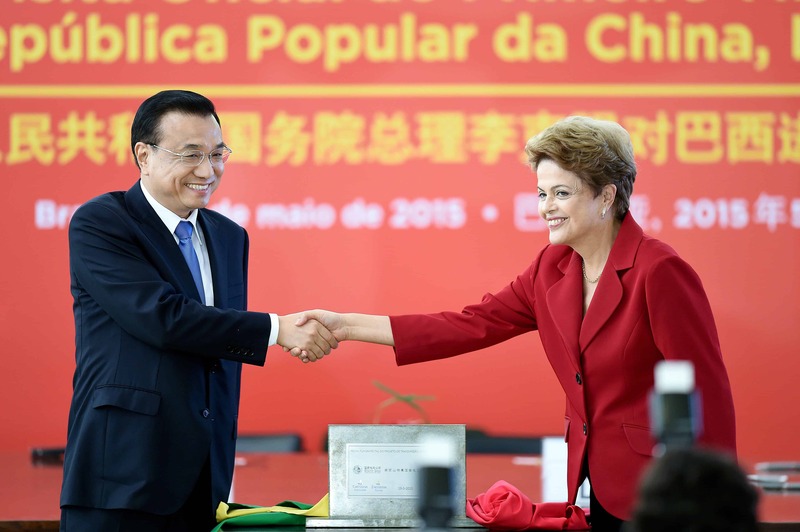 Deals signed during the visit of Premier Li Keqiang coincide with Brazilian President Dilma Rousseff’s efforts to kick-start an economy that is forecast to contract 1.2 percent this year, its worst performance in a quarter-century. China also said it will study investments to expand and modernize Brazil’s bottlenecked roads, ports and railways. “Investment between China and Brazil can and will mean an improvement of our economic situation,” Rousseff told a group of entrepreneurs from both countries on Tuesday. One of the biggest projects Chinese companies are eyeing is the construction of a railway that would link the Atlantic and Pacific Oceans via Peru. China Three Gorges Corp. is interested in the construction of the Tapajos hydroelectric generator in the Amazon rain forest, which would be Brazil’s fourth-largest dam and cost at least 18 billion reais ($6 billion), according to a government official who asked not to be named. The two countries also signed an agreement to allow the export of beef from Brazil to China, which had been banned since 2012. Brazil is the first stop on Li’s Latin American visit that also includes Colombia, Chile and Peru. Exports to China, Brazil’s largest trade partner, fell 12 percent in 2014 as demand for commodities including iron ore and soy beans eased. The 22 jets Embraer will sell to Tianjin Airlines, a subsidiary of the HNA Group, are part of a previously-announced commitment to supply 40 aircraft. The deal is valued at $1.1 billion at current list prices. Airlines typically receive a discount on those prices. Chinese authorities later should approve the other planes, Embraer said in a statement. China is forecast to need 900 aircraft with 70-130 seats in the next 20 years, Paulo Cesar Silva, head of Embraer’s commercial jet business, said in a May 11 interview with Bloomberg Television in Singapore. The China Development Bank last month extended a $3.5 billion loan to Petroleo Brasileiro, just as the embattled oil company was struggling to quantify operating losses due to corruption and mismanagement. More than half of the suppliers investigated for paying bribes also will close deals with Chinese banks and companies, according to Charles Tang, chairman of Brazil-China Chamber of Commerce & Industry.